In the year of 95' Hildr started with Saturnalia her first band called Beyond The Forests. After one year cause Saturnalia decided to join Kawir, Hildr joined lloth (now known as Astarte). 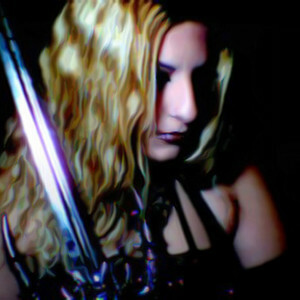 After some recordings and a little time before the first demo being released, some bad situations made her to leave the band and join Nocternity. However, all was going well, and had already recorded some of the songs for the first demo, for several reasons the band split up. Khal Drogo continued with Nocternity. The vocalist (Acherontas), bassist (Devilish), drummer (Spyros) and keyboardist (Hildr) made a new band called Worship. During the year of 97' Saturnalia returned and all the band release a mini cd called "Through the dark age we are dreaming". So then they make their first concert. Lately Worship renamed to Beyond The Forests as it was Hildr's first band, and released their first full album called "Battles From Beyond" and came the second concert. At the year of 99' the band spit up once more. Acherontas and Devilish made Stutthof and released "Hecate's Embrace" where in this album the most songs were taken from "Battles From Beyond" cd. Hildr and Saturnalia stopped to be into bands, but Hildr always was working by herself at the background. At the year of 2003 Hildr decide to make a new step by joining Ego Drama, but the cruelty of the band and non character made her leave the band very soon. So, she decided to create her own band... and "leave it all behind". In the same year Hildr started writing on her own material and in 2004 there was her first release. The self-financed demo "Deceitful Fate" featuring 9 tracks and 1 cover, had many good comments worldwide. Epic tunes and angelic voice is the result of Hildr's inspiration. This combination was never performed by any other band from Greece. As being inspired by the music of Falkenbach, Hildr Valkyrie showed her respect to this one-man band and made a cover (with the help of Alboin on guitars) which appeared on "An Homage to Falkenbach" with the song "The Heralder" and was released by Skaldic Art Prod. at the end of 2005. During 2005 and 2006 after the appreciation of Hildr's work, some skillful bands asked her to join them as a guest or session... and the battle goes on! 2004: Her first demo was released in 2004 and had the title "Deceitful Fate". 2005: In 2005 Hildr becomes a proudly member of Folkearth. Also a session member "Alboin" activated to her band and offered his valuable help, recording the e-guitars for the second demo. Also united her powers with Morgan the bard and joined the band as vocalist. Other projects she's been involved in: Morgan the Bard, Femegericht, Death Army, and Odins Court.